When a call reaches an extension voicemail, callers can choose to leave a voicemail or dial <0#> to be directed to the branch receptionist. By assigning a receptionist at the extension level, you can make sure calls requiring immediate attention get a live response rather than landing in the voicemail box. For example, if a customer tries to reach Tier 1 Support after hours, the branch receptionist for Tier 1 Support may point to the ring group of Tier 2 Support with extended hours. 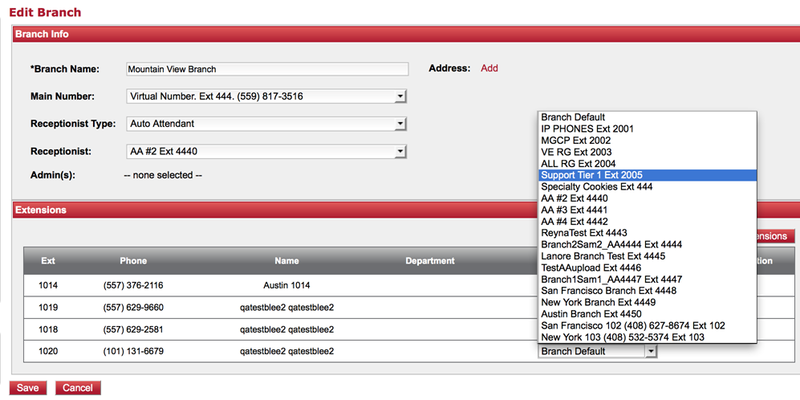 During branch definition, the Receptionist Type determines how to route the calls reaching voicemail. If you need a different routing for a specific extension, you can specify the desired destination at the extension level to another extension, a ring group, call queue, auto attendant, or a different branch. Note: The receptionist type for service extensions should be configured in the service extension configuration page. Within the branch setup, click Manage Extensions. Click to choose a different receptionist from the drop-down list, instead of the branch default.